It has been over 135 years since J. Sterling Morton founded Arbor Day, and his simple idea of setting aside a special day for tree planting is now more important than ever. If you’re looking for inspiration for your own celebration—whether for a classroom or an entire community—here are a few suggestions. Choose people who have made a difference by advocating for or accomplishing something environmentally significant within your community. Consider honoring people who have initiated or completed projects like establishing a tree planting or recycling program; identifying or planting an arboretum; or raising funds and getting permission for an outdoor learning center. If possible, seek nominations from the community. Once the results are in, publish a booklet with a map that lists the locations of the winners, label the winners that are in public places or provide a walking tour of the winners. Trees of historical significance to the community could also be added to the tour. Get details about organizing a Community Tree Contest. Be sure to choose the right tree for the right place and correctly plant and care for it. Ask members of the planting committee to sign a pledge to care for the tree and bury it in a time capsule near the tree. Take a photo of the planting crew and send it to the local newspaper to tell everyone about the significance of the new tree. Host a reception to honor the Tree Board members in your community. Invite representatives from city agencies as well as the community at large. Plant a tree at City Hall and have the Mayor issue an Arbor Day Proclamation. Local school children can read poems about trees, and refreshments can be served. If your community is a designated Tree City USA, the reception should honor this accomplishment. If not, work with your city or state forester to make your community a Tree City USA. A good choice for an Arbor Day play is Trees: A Joy Forever. Remember the older residents in nursing homes and retirement villages. They may have some Arbor Day stories to share and are usually a very appreciative audience. Day care centers are also very receptive to special programs. Recycle what you can and dispose of the rest properly. Ask residents within the area to help with the cleanup and encourage everyone to maintain the area once the work is done. Sign a park care pledge and post it in the park shelter or on a bulletin board in a city building. Plant trees, flowers, and shrubs to beautify the area even more. Read a book about trees. Learn to identify the trees in your yard by their leaves, bark and seeds. Our tree identification field guide is a great place to start. See what animals, birds and insects live in and around a tree. Lie down on the ground and look up through the branches, noticing the light pattern created by the branches and leaves. Create a bark rubbing using paper and a crayon. Join the Arbor Day Foundation and help plant trees in our nation’s forests and in your yard. Hold an Arbor Day Birthday Party for the community. Read an Arbor Day Proclamation, plant a tree and serve cake and ice cream. As guests leave, hand out tree seedlings or a coupon from a neighborhood nursery. Sponsor a craft show featuring exhibitors who engage in crafts with natural materials. Woodcarving, pottery, dried flower arrangements, cornhusk dolls, pinecone wreaths and pressed flowers are just a few examples. Cooking demonstrations could also be held using products derived from trees. Recipes that include apples, nuts or chocolate are among favorites. Make sure you provide samples for the audience! Charge a small registration fee and use the money to purchase tree seedlings for the participants, or buy one larger tree to plant on public property in honor of those attending the class. Hold a Read-In at the library. Have all available books about trees—both fiction and nonfiction—on display. Story time for younger children can feature tree-related books. This is a great way to increase awareness of the tree resources available at your library. Compile a playlist of songs about trees or that include tree names in their titles. Give trees away as prizes. Organize a tree identification hike. This could take place in a park, at a nearby forest or along the streets of the community. Ask girl scouts and boy scouts to serve as guides. It’s a great opportunity to meet new people and make a difference in your community. 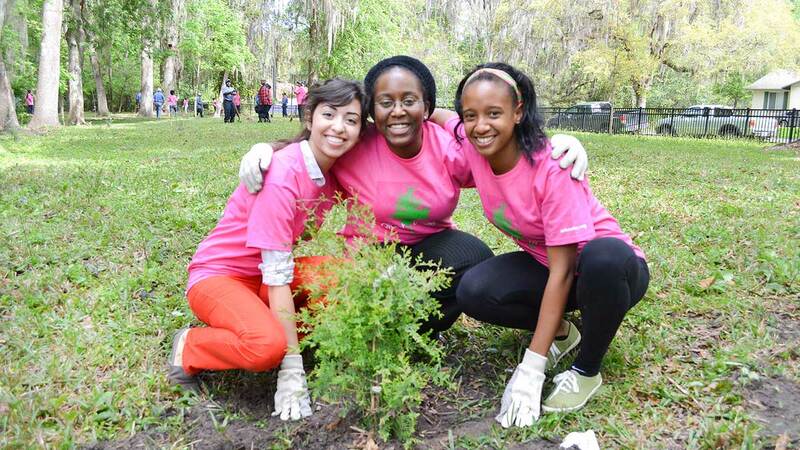 Encourage neighborhood organizations to hold Arbor Day block parties. It’s a good way to get attendees excited about caring for the street trees in front of their homes and planting more trees in their yards. Buttons and tree seedlings make great giveaways at these events.